Description: The Trekk thermal set is perfect to accompany you on any outing. The insulated bag is manufactured from modern Dobby material and is supplied with a thermal drink flask and two matching mugs. Supplied in a Trekk gift box. 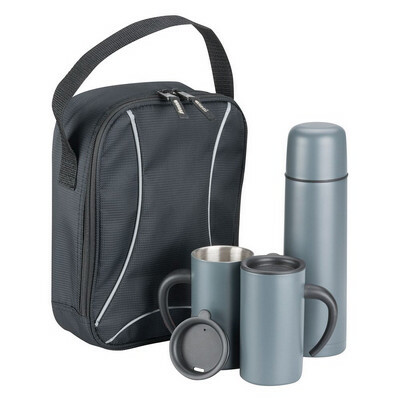 Features: Packaging: Mugs & Flask are packed inside the Trekk carry bag which are packed in a polybag. Presented in a black gloss 2 piece box with product details over the outside of the box. Packaging size: 275mm(w) x 180mm(h) x 80mm(d) Colour: Black bag with Silver lining and Silver drinkware Material: Insulated bag dobby fabric Product Size: Carry bag: 285mm(h) x 175mm(w) x 80mm(d), Flask: 235mm(h) x 70mm ?, Mugs: 118mm(h) x 64mm ? Freight details : 12 per carton, 14kgs, 60 x 43 x 30cms; Decoration Type(s): Colour Print / Full Colour Print / Laser Engrave Decoration Area: Screen: 120mm(w) x 50mm(h) on Carry bag. Price includes : 1 Colour 1 Position Print. Setup is included.